Apollo started out as a MP3-player. It is recognized by its outstanding MP3 decoding quality, powerful continuous playback support and advanced playlist capabilities. It supports different file formats through so called input plug-ins. Writing an input plug-ins is rather straight forward (see the plug-ins page for more info) and thus Apollo can be easily made to support new audio formats. 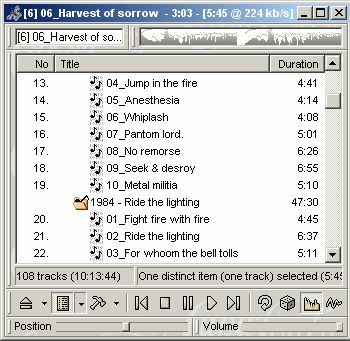 The player routines provide continuous playback or even a crossfade between tracks on all supported formats and with all output types (standard Wave Out, DirectSound and WAV file output). It is possible to direct the output into a WAV file, thus making it possible, for instance, to decode MP3s for writing them onto a CD. The player routines also provide a realtime 16-band equalizer for all file types. Currently Apollo ships with two input plug-ins: Apollo MPEG decoder and Apollo WAV decoder. The MPEG decoder is capable of handling both MPEG-1, MPEG-2 and MPEG-2.5 audio layer 2 and 3 files (i.e. MP2- and MP3-files). The decoder is capable of producing 32-bit, 24-bit, 16-bit and 8-bit data. Also Xing and Fraunhofer VBR MP3s are supported. The MPEG decoder is generally thought to be one of the best as far as sound quality is concerned (see FAQ for more information about the quality). The WAV decoder supports RIFF WAV files containing PCM or Microsoft ADPCM coded data. Both plug-ins support Internet streaming.